/Ideable, nominated in Europe and worldwide for Kwido in various awards for Silver Economy initiatives . Kwido is a candidate to win one of the European Union-funded Silver Economy Awards, which promote and reward innovative and creative ideas that are beneficial to people aged 50 and over in Europe. 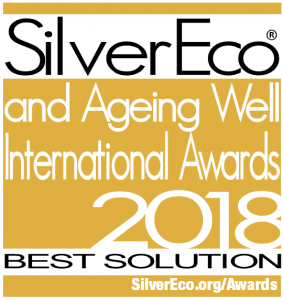 Ideable’s Kwido is also nominated in the SilverEco and Ageing Well International Awards, this being a worldwide competition that will be held in France this year. Kwido has been selected from all the innovative solutions presented as one of the best European applications in the private organizations category. The winners will be announced at a ceremony to be held on 3 May in Brussels organised by the European Committee of the Regions. Developed by the SEED project funded by the European Union, the European Silver Economy Awards aim to catalyse a sustainable European digital Silver Economy movement by promoting and rewarding innovative solutions to improve the quality of life for over 50s in all areas that contribute to improving the quality of life of this group of people. These awards are a perfect opportunity to promote and strengthen the European Silver Economy. The ceremony in Brussels where Kwido will be present will be a unique opportunity to exchange ideas with European Silver Economy leaders. 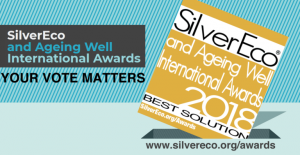 The Silver Economy Awards and Ageing Well International awards aim to bring together all international Silver Economy stakeholders for an awards event in Paris at the end of March. We are very excited to have been chosen as one of the best European applications, out of thousands of others, by members of the Alliance on Demographic Change, which European public authorities committed to the Silver Economy form a part of. • Innovation – rewarding our efforts to create an innovative product. • Benefits – this recognizes Kwido’s positive impact and benefits in promoting environments that support active and healthy ageing, improving the independent living and well-being of the elderly, and creating a society for all ages. • Economy – the jury took into account the economic value that Kwido creates in terms of the financial aspects and resources that we have had to prove. • Maturity – the members of the jury reward the level of maturity that Kwido has achieved, both in terms of technology and in the target market. • Business model – to nominate us they have taken into account the economic sustainability that we have achieved with the Kwido business model, and the profitability we have achieved thanks to market income. in Spanish, English, French, Italian and soon in Portuguese. We currently have a geographical presence in Spain, the UK and Switzerland. That’s why we are a bit restless, as Kwido has some very important dates coming up.